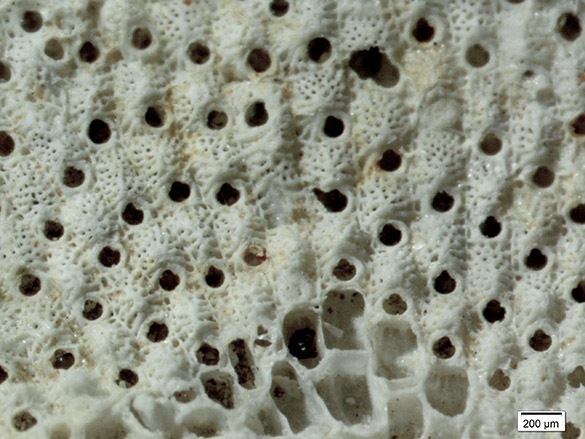 A bryolith is a mobile, unattached mass of bryozoans. Cheilostome bryozoans are especially good at forming bryoliths because of their hardy skeletons and relatively rapid rates of growth. The above specimen is a bryolith collected by my good friend Al Curran in March 2008 from Duck Creek in Cape Cod Bay near Wellfleet, Massachusetts. It is a modern specimen, so not actually a fossil, but I present it here because these objects have a good fossil record. The bottom view of the bryolith is below. The tubes twisting about in this mass are those of polychaete serpulids. 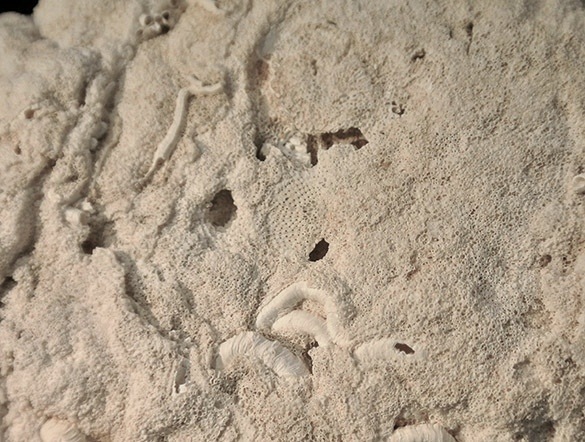 These are filter-feeding “tubeworms” common on marine shells, hardgrounds and rocks since the Triassic. We’ve met them many times in this blog. They are frustrating to identify from the tube alone because the soft anatomy (especially the genitalia, if you can imagine them) are needed to sort out most taxa. They tend to live on the undersides and cryptic spaces of hard substrates, which you can see when comparing the top and bottom of the above specimen. 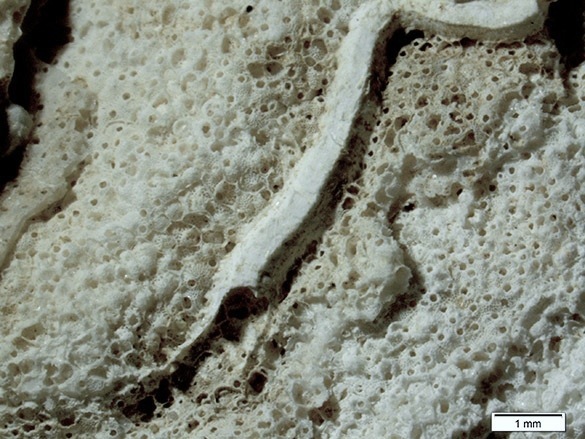 With this closer look (above) we can see the fabric of the bryozoan skeleton (the zoarium). Individual zooecia (the skeletal tubes of the living zooids) are coming into focus. 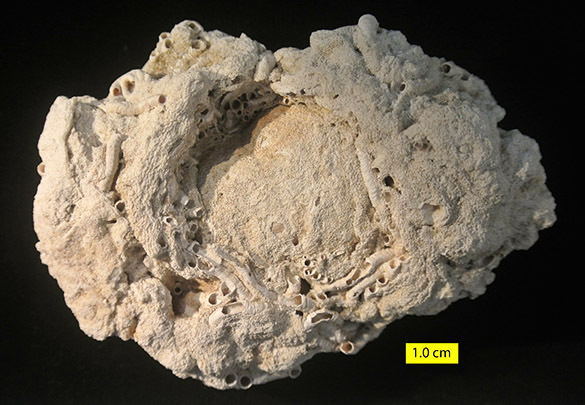 It appears from the intergrown nature of the serpulid tubes and bryozoan that these two groups were living together at the same time. In this even closer view we see a serpulid tube embedded in a matrix of cheilostome zooecia. The apertures of the zooecia are now visible, and a bit of the frontal walls. This is the closest I could get with our camera equipment. The frontal walls and apertures of the zooecia are easily seen. In life each aperture would have had a little door (an operculum). The frontal walls are a beautiful lattice-work of calcite. I hesitate to suggest an identification for this cheilostome bryozoan because one of the world’s experts, my English good friend Paul Taylor, reads this blog. Nevertheless, I think these are of the widespread genus Schizoporella. Paul will correct me quickly if I’m wrong! Kidwell, S.M. and Gyllenhall, E.D. 1998. Symbiosis, competition, and physical disturbance in the growth histories of Pliocene cheilostome bryoliths. Lethaia 31: 221-239. Klicpera, A., Taylor, P.D. and Westphal, H. 2013. 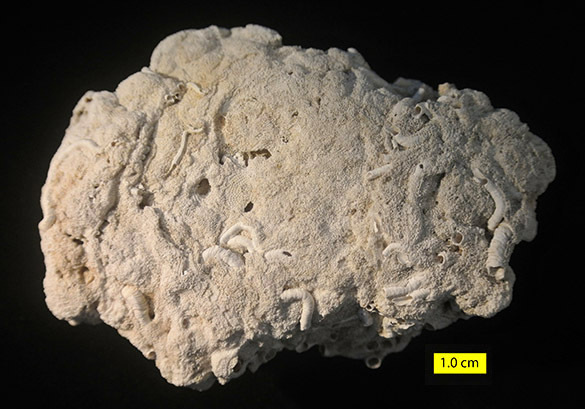 Bryoliths constructed by bryozoans in symbiotic associations with hermit crabs in a tropical heterozoan carbonate system, Golfe d’Arguin, Mauritania. Marine Biodiversity: http://dx.doi.org/10.1007/s12526-013-0173-4 .